Having dropped its first game of the SEC Tournament, Ole Miss looked to extend its stay in Hoover by defeating Georgia in an elimination game Thursday. The No. 8 Bulldogs, losers to A&M in their first game of the tourney, and the No. 4 Rebels were both hoping to strengthen their national seed chances with a victory. 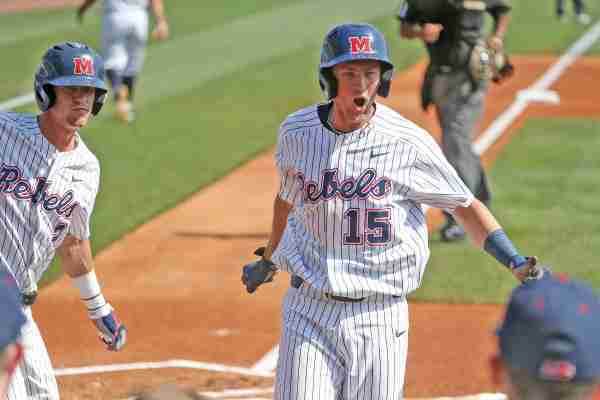 Sophomore Grae Kessinger got things started with a bang for Ole Miss, hammering a leadoff home run to right field. 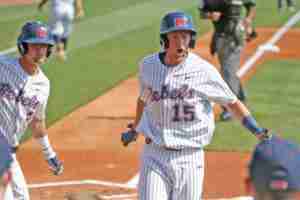 It was the shortstop’s eighth home run of the year and propelled Ole Miss to an early 1-0 lead. In the fourth inning, center fielder Will Golsan stroked a double to left and subsequently scored on Chase Cockrell’s single to center. 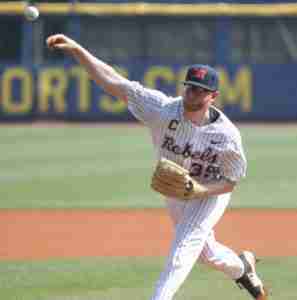 Rebels’ starter Brady Feigl dazzled on the mound in his 15th start of the year. The junior captain threw 6 ⅔ innings, allowing just a single run and three hits. Feigl struck out three Bulldogs and allowed only one walk. His appearance was cut short when the rain arrived at the Hoover Met. After a one hour and fifty-three minute rain delay, with Georgia still batting, Ole Miss looked to Parker Caracci for a seven-out save opportunity. Feigl, who left the game with a 2-1 lead, was in line for the win. Kessinger led off the 7th inning for the Rebels, powering his 16th double of the season down the line to the wall in left field. He scored when Thomas Dillard legged out a potential inning-ending double play. Caracci got into a jam in the Georgia half of the eighth inning when the Bulldogs put runners on second and third with no outs, after a lead-off double that was followed by a single and a stolen base. Caracci was able to dial it up a notch striking out the next two Georgia batters. Unfortunately for the Rebels, the Bulldogs scored two runs to tie the game at 3-3 when Caracci attempted to go home on a hard hit ball back to the mound. Ole Miss then went 1-2-3 in the eighth and ninth innings as did Georgia in its half of the ninth. With the game tied at 3-3, it was time for extra innings. Entering Thursday’s game, the Rebels owned a 1-2 record in extra innings, while Georgia was 2-3. Though the Bulldogs took the lead in the top of the tenth with a leadoff home run, Georgia was playing an Ole Miss team that continues to show its “never say die” spirit. Catcher Nick Fortes singled to get things going in the Rebel half of the tenth. Left fielder Thomas Dillard doubled Fortes home on a 3-2 cut fastball that evened the score at four. Right fielder Tim Rowe—who got the start when usual third baseman Tyler Keenan aggravated a wrist injury and was held out of the game for precautionary reasons—made the most of his opportunity at plate. He singled up the middle to score Dillard from second and won the game for Ole Miss, 5-4, in the process. The victory was the Rebels’ 18th come-from-behind victory of the season. “I’m just proud of our guys the way we hung in there,” Coach Bianco said. “And I thought Brady Feigl was terrific,” he added. When asked about Caracci’s error in the eighth, Bianco responded, noting his pitcher’s mental fortitude. “One of the amazing things about that is then he struck out their best batter after that and got off the field,” Bianco said of Caracci. “And that’s who he is. He can handle it and not let it blow up on him,” he added. “He looked amazing, with 3 ⅓ innings, seven strikeouts, no walks,” Bianco continued. 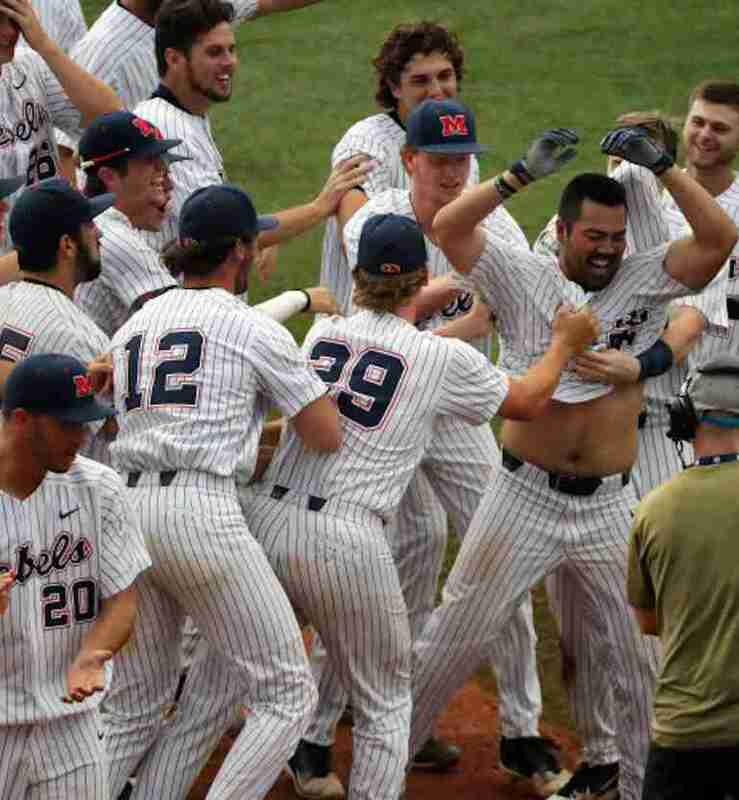 The Rebels play Auburn at 3:00 p.m. Friday in an elimination game. The Tigers lost to A&M, 4-2, Thursday night.